My Monday rant: I’m not merely swamped, I’m tsunami-ed. Overrun with the remnants of an at-home Super Bowl watch (no actual party but we made a mess like we had one.) At least the dishes are clean, but there’s a slew of them to put away, and bags of snack chips and crackers an cookies strewn across the island. After my two-day stint on the couch loaded up on cold meds last week, the never-ending mound of laundry has mounded higher. The refrigerator is barely contained chaos and probably has a few science experiements growing in the dark recesses. My fount of of junk mail overrunneth. And – like that wasn’t bad enough – the contents of the attic are now stacked precariously in the bonus room. We started another project: installing new shelving. But by Saturday evening, we ran short on supplies and failed to finish. My closet floor is a land mine field of every pair of shoes I’ve worn in the past month. Empty shoeboxes yawn on the floor. Our garage is still cluttered with the remains of refinishing the kitchen table and chairs. (A project I DID finish, even if I left a mess out there.) Besides, that’s not the only mess out there I need to work on. Ugh. Basically, my house looks like Richmond after Grant ran it through. (Actually, it would probably look BETTER in the aftermath of a battle.) I’d like to say this is a highly unusual occurrence, but since the holidays, we have been gradually sinking into this pit of despair. Bottom line: I have too-many-to-count projects started and stalled. I pride myself on being fairly nimble and adept at multi-tasking but the current state of affairs hints that I might not be as adroit as I think. Certainly I need to get better at finishing what I start. Although new projects are always so beguiling, and I tell myself I can finish one AND start another one simultaneously. Because every malady needs a name and an acronym, I dub mine MPTDD: Multiple Project Time Deficiency Disorder. I don’t lack attentiveness, I merely lack the necessary time to complete every project. And picking one project to focus all my efforts on just wouldn’t be fair to all the other projects, now would it? And as wise folks have pointed out, the first step in solving a problem is admitting you have one. So there. I did manage to make our bed up (with all nine million pillows and everything) while my last cup of morning coffee was brewing and my English muffin was toasting. So maybe I can multi-task – at least with the help of kitchen appliances. Next on today’s to-do list is a quick cleaning of the downstairs bathrooms and running (literally) the vacuum. It’s embarrassing to see artificial pine needles and itty bitty fake snowflakes in little drifts in the corners. The refrigerator might get an overhaul while I fix dinner, although that will mean skipping weight lifting and running tonight. Sigh. The bonus room will have to be endured this week until we can carve out an evening to finish the shelving. And just in case you get curious and want to come see this hot mess for yourself, be forewarned: if I answer the door and give you the tour of the crime scene, I will probably put you to work. My shame does not preclude me from asking for help. Otherwise, I will console myself with the knowledge that it’s always darkest before the dawn. And there are still six-plus weeks until spring, and once the temperatures start to warm up a bit, I might be a bit more inclined to tidy the garage. And hey, six weeks is enough time to start at least a half-dozen more projects, right? Around here, the past couple of winters have been really mild. Uncommonly mild, even. Last year, we watched and waited for winter to arrive, and it never did. Not really, anyway. We just kind of shivered our way into spring. But apparently THIS winter has decided to settle in and give us a good run for our money, at least in terms of temperatures. If I could ask for anything, I would like a little snow to go with the cold. Please and thank you. This is how our week is shaping up, weather-wise. I know, I know. I shouldn’t whine. This is nothing compared with some parts of the country, where minus signs frequently appear in front of temperatures, and polar vortex is NOT a noteworthy weather phenomenon. But here in middle Tennessee, we live on the teetering transitional edge between north and south. And some years, our average lows hover in the mid-30s – not exactly tropical, but not exactly locked in the icy clutches of winter, either. Part of me is glad I don’t have my greenhouse up and running this year and part of me wishes I did. Even on a cold, blustery winter day, a little sunshine and a space heater can make it feel like spring. But there is a big price to pay – namely the cost of keeping the inside above freezing every night. While we start the inevitable countdown to spring (I generally begin marking off the weeks to last frost as soon as Super Bowl Sunday has come and gone), I’m focusing my time and attention on indoor stuff: cleaning, organizing, crafting, cooking and exercising. Maybe not in that order. Last week’s menu had several new items from January’s Southern Living recipes. This week’s menu has a few more recipes from that issue. I’ve finally embraced the no-knead bread recipe, and we’ve eaten two loaves in as many weeks. I don’t know why it took me so long to give it a shot, but I’m glad I did. I got February’s Southern Living in the mail over the weekend and there are several more good-sounding recipes in it, so my family can rest assured they will get a nice mix of old favorites and new foods over the next several weeks. I’ve kept up with my daily Bible reading and the 52-week organizing challenge; this week is pantry and spice rack cleanout. Luckily for me, I had done a pantry re-org before Christmas, so I’m coasting for a few days. 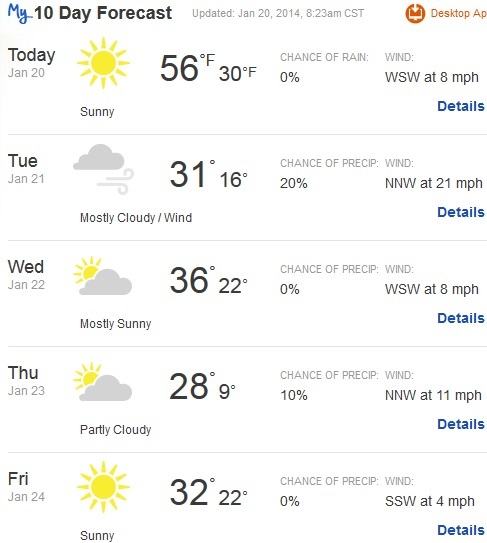 Next week’s challenge is to set up a home recycling center, which is unnecessary because we have curbside recycling, and they sort everything for us, so if the temperatures aren’t bitterly cold, I hope to use that week to clear out a lot of the clutter in the garage. No promises, though. I like to think of it as part of the organization challenge, but whatever you call it, I’ve abandoned any pretense at limiting my Fiesta collection. And so I’ve begun the hunt for a new/second hutch for the kitchen…a two-piece style with a breakfront so I can eek out a little more counter space as well as have more display room for my vintage dishes, and lower cabinets and drawers to stow cookbooks and linens and a few less-used cooking and serving pieces. I found a Hoosier-style oak cabinet last weekend at an antique mall, and I loved everything about it except the width (too narrow) and the price (too high.) I’m holding out hope that stalking Craigslist will eventually yield the piece with exact dimensions and price I’m looking for. So how is your winter going? Are you like me, and ready for it to be over and done with already? Or are you settling in and enjoying the season? Today and tomorrow we’ll hit close to 80 again – probably for the last time this year. In two days we’ll be lucky to hit 70, and the day after that we’ll be in the mid-60s. The extended forecast shows us bumping along in the 60s and low 70s throughout October, and the temperatures will continue to drift and tumble downward. It’s time to trade out the sleeveless tops for something with a bit more coverage. No complaints here – the marked change in seasons gives me the perfect excuse to change our family dinner menus and decor along with my clothing choices. Later today I’m hoping to take advantage of this last gasp of summer weather to work outdoors and finish refinishing our kitchen table and chairs. And then it will be time to start winding things down for the season…and winding up for the next one. A few days ago, I awakened from a movie binge. (At least for me, this many movies in just a few weeks constitutes a binge. For others, maybe it’s just normal viewing activity.) Looking at this following list, the average age of my movie choices is north of a decade. I’m not a new movie buff, it seems. 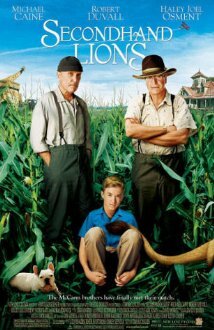 Among my newly discovered favorite movies is Secondhand Lions (2003), with Robert Duvall and Michael Caine. It’s a heartwarming coming-of-age tale with a “used” lion thrown in for good measure. There’s a reason I mention it first – it’s the pick of the litter. I also caught A River Runs Through It (1992), October Sky (1999) and Good Will Hunting (1997). Let’s just say I’m glad I watched the network cable version of Good Will Hunting, which had a lot of dubbed-over words. And I give high marks to the creativity of the censors – they found a lot of different words to use in lieu of the “f” bomb. And they had many opportunities to use those substitutions. I watched Stepmom (1998) through tears (again) last week. It’s like dark chocolate – you have to acquire a taste for bittersweet, and on the heels of my recent biopsy, the specter of cancer hit a little closer to home this time around. As I waded through The English Patient (1996) I was reminded why I prefer Casablanca: it was first, and it knocks an hour off the time it takes to spin the same theme. The Notebook (2004), a perennial favorite, especially if you love Charleston like I do. The Vow (2012), in which Ms. McAdams continues to muddle about in a state of confusion when it comes to affairs of her heart, bless her…well, heart. The Devil Wears Prada (2006), which makes me thankful for my own ghosts of (gracious) bosses past. Sleepless in Seattle (1993), a MFG (made for girls) movie based on another, older girls movie (An Affair to Remember). But an easy watch nonetheless. Pretty Woman (1990) and Oceans Twelve (2004)…otherwise known as two faces of Julia Roberts. Julie and Julia (2009), the movie that launched a million blogs and sold more than a few cookbooks as well. Juno (2007), which isn’t quite a true chick flick, but it resonates more with girls than boys, I daresay. Jerry Maguire (1996), which is a little bit o’ football, and a whole lotta romance. To avoid overdosing on all that sweetness, I used Trouble with the Curve (2012) to ease into sports movies, Remember the Titans (2000) and Any Given Sunday (1999), and two prison tales, The Green Mile (1999) and Shawshank Redemption (1994), capped off by the second half of The Bucket List (2007), a dusting of Joe Dirt (2001) and most of Zero Dark Thirty (2012), just for good measure. See, this is what happens when Mr. Official is off officiating, Swimmer Girl is away at school, and I have full control over the remote for the entire evening several nights each week. Care to join me? Just bring some snacks and drinks, and maybe a few tissues…we’re sure to find something worth watching. Or send me a list of your favorites, and maybe they’ll become my faves, too. My blogging muse up and left. Abandoned ship. She went AWOL and MIA. All. Summer. Long. It wasn’t that I didn’t have stuff to write about. It isn’t that I didn’t have time. I just couldn’t find the words. A lot of things conspired against my efforts to blog during the past several weeks (err, months.) But I think (hope!) I’m ready to get back in the saddle, or swing, or whatever. We moved Swimmer Girl into her first dorm room in August. That was an experience filled with growing pains for mom and daughter, but after some shaky days, things have started to steady out. She’s been home once and I’ve been down for a visit once. It gets easier, right? Right??? Mr. Official and I discovered we both like hot yoga, so on Tuesday and Thursday mornings you’ll find us at a local yoga studio for an hour of balancing and contorting in sauna-like conditions. My routine mammogram turned out to be not-so-routine. Everything is fine, but it was a wake-up call. More on that later. Suffice it to say that October is breast cancer awareness month, and I have a little different perspective on it this year than in year’s past. The fall TV lineup started without me. I have no clue what’s on these days. But I have caught up on a lot of movies lately. Some new, some repeats, some three-peats. I’ve actually READ a couple books lately, and I’ve started back in on a daily Bible reading program. For now, it consists of reading through 1 John (all 5 chapters) every day for a month, plus each day’s chronological Bible reading I’ve been doing on-and-off all year. Curious? We’ll talk. I’ve added a few (really, just a few) pieces to my new and vintage Fiesta collection, raising eyebrows from family members who mutter things like “hoarder” and “intervention” “how many pieces do you need?” under their breath. I think I just need to learn to intercept the FedEx and UPS trucks before the telltale packages hit the doorstep. 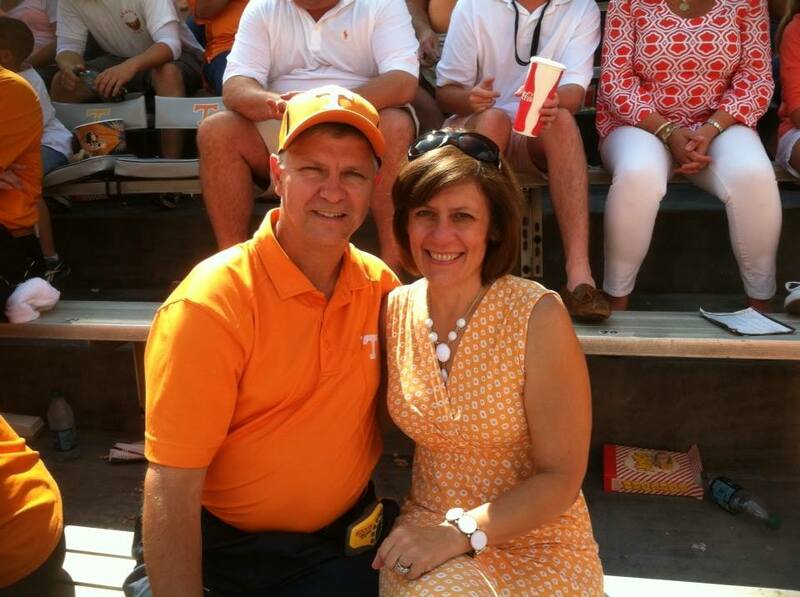 UT football is in full swing. This was us at last Saturday’s game. It’s good to be back, and I hope I can catch up on how everyone else’s summer went. Por que no recetas de cocina? Life has been busier-than-usual, and dinner sometimes takes a backseat to everything else. I have to be home in order to cook. And I find it helpful to have one or more diners on hand if I AM cooking. If one or both of those conditions are not met, dinner doesn’t happen. When I do cook, I am a terribly forgetful food photographer. I don’t cook with a camera at hand, and by the time I determine we like(d) a new dish, it’s too late to snap any photos. An empty dish may be a positive sign, but it’s not a very appetizing or inspiring image for you, dear reader. And I felt bad not having gorgeous photos to go with every step of prep, a la Christy Jordan’s Southern Plate or The Pioneer Woman. In hindsight, I would chide myself and vow to re-create the dish and remember to photograph it to share. Except I rarely remember to do that, either. So, my choices were to stop sharing recipes or to share them sans images. These days, we live our lives surrounded by images; we’re a very visual society. I had to remind myself that it wasn’t always so, and that I still try MANY recipes based on the ingredients, not on a photograph. So I’m gearing back up to start cranking out a weekly recipe again. If and when I’m on the ball, you’ll get a visual to go along with it. If not, well…trust me: if I share it, it tastes good. Friends don’t give friends bad recipes. 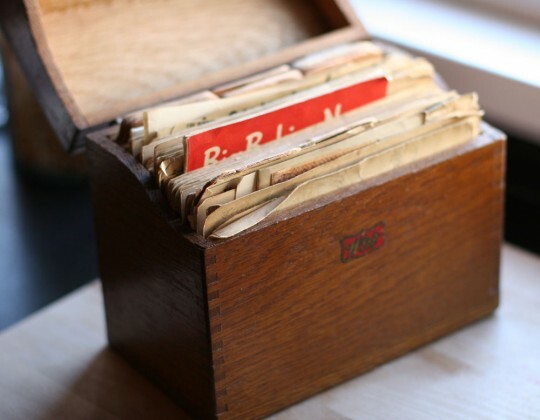 So think of my posts like a virtual version of those dog-eared, batter-spattered index cards and clippings of olde. Even if you can’t see what it looks like, it’s still worth a try if you like the ingredients. Stay tuned: Friday’s recipe is a new cool creamy dessert concoction I whipped up a couple weeks ago. Almost immediately after Swimmer Girl’s graduation, Mr. Official decided we needed a sprinkler system for my plants, so the past few okay several weekends have been devoted to various phases of this project: trenching, assembling, covering, testing, tweaking, sodding, mulching….you get the picture. In addition, I’ve managed to lug home something like 25 new trees and shrubs to plant, in addition to not-counting-not-telling how many hostas and other perennials. Garden beds are like church pews: there’s always room for more if everyone will just squeeze together a little. Our fourth All-Summer Bible Vacation series kicked off the first Sunday in June and it looks like we’re going to have another fabulous summer of arts, crafts, games, stories, singing and silliness that goes with kids and summers. Last week, Swimmer Girl had her mandatory college orientation, and so did her mama. Two days of being reassured that our little fledglings are ready to fly the coop was a bit much, but it seems my generation’s parenting style is way more “hands-on” than our parents’ was. And that’s the polite term for our hovering. At any rate, we can now check that activity off our summer to-do list, which also means we’ve started the countdown clock to moving date. Just six short weeks to finish this particular chapter in our parent/child story. And make sure she has all the necessities and niceties that an apartment-style dorm needs. It’s so beyond the old-school new bedspread, lamp and the towels-that-you-don’t-care-if-they-come-back-or-not. We’re talking about outfitting a four bedroom, two bath apartment with a full kitchen and living room. It should be interesting to see what four girls can do to decorate their little corner of the campus. I’ve updated our “What’s for dinner” in the sidebar, and if any of the new-fangled recipes work out, I’ll post them later this week, as I try to get back in the routine of actual cooking (what??? really???) and cleaning.